Strangers helped pay for Lucas McCulley's surgery after his plight went viral. The tumor doctors call the most extreme and complicated they’ve ever seen is finally gone from Lucas McCulley’s face. It took more than seven hours of surgery at the New York Eye and Ear Infirmary of Mount Sinai last fall to remove the mass — the 25th operation McCulley has endured in his life. He went public with the results on Monday, showing off a face that’s much lighter and pain-free. It’s been a long, sometimes excruciating journey for the 22-year-old. He was born with a lymphangioma, a non-cancerous congenital tumor on the right side of his face likely caused by a random genetic mutation. After the first two dozen surgeries McCulley underwent as a child, doctors told him they couldn’t operate again until his body stopped growing. But when he became an adult, financial issues got in the way. McCulley lost health insurance when he turned 18 and wasn’t able to get disability, which would qualify him for Medicaid, NBC affiliate KTVB reported. Dr. Gregory Levitin, director of the Vascular Birthmarks and Malformations Program at the New York Eye and Ear Infirmary of Mount Sinai, performed the surgery last October. He called it the most challenging case he’s ever seen. McCulley’s tumor was filled with lymph fluid and dozens of “tremendously large” blood vessels — some the width of a man’s finger. That meant the risk of potentially life-threatening bleeding during surgery. Lucas’ facial nerve — which allows a person to smile, blink and raise an eyebrow — was interwoven within these vessels. Levitin had to find it and maneuver carefully around it to avoid leaving Lucas with a paralyzed, sagging face. The massive tumor also deformed some of McCulley’s facial bones. “There was no easy way out of this,” Levitin said of the complex surgery. He was able to remove about 80 percent of the mass, but left behind a “shelf of tumor” that’s holding up McCulley’s right eye. Getting too close to that area risked causing blindness. 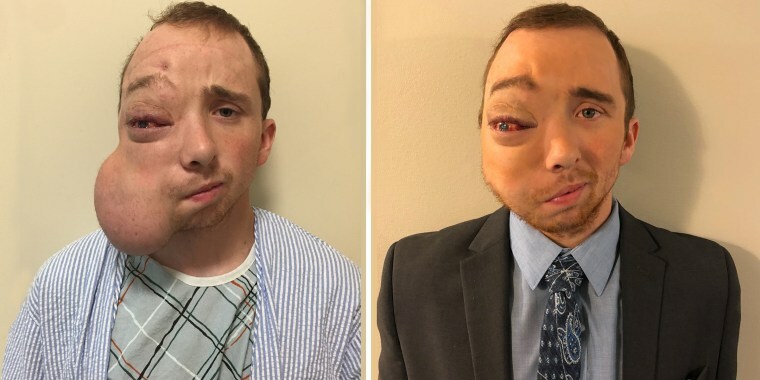 “[People will say] ‘The face looks amazing, but how about that eye?’ Well, he can still see out of that eye and he was not willing to take any risk of losing that vision to try to make the eye socket look more normal. That’s really Lucas’ call,” Levitin said. Levitin removed so much of the tumor that it can’t grow back again in the same way. The most important aspect of the surgery is that McCulley is pain-free now, Levitin noted. The huge tumor was filled with lymph fluid and blood, so it was constantly under pressure, plus it was pulling down on McCulley’s face. He was in pain day and night, he said. Now, the pain is gone. Since the surgery, McCulley has moved out from his mother’s home and lives on his own. He works in construction, but is still interested in joining the U.S. Army — something he couldn’t do before because he couldn’t fit a gas mask over his face, he said. He’s also grateful for everyone who donated money for his medical expenses. It paid for his surgery and the cost of travel, he said.